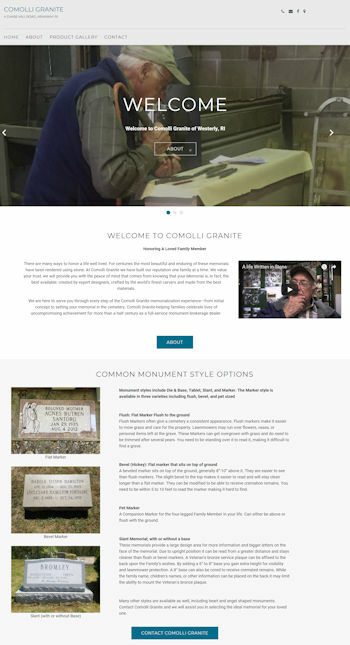 30-Mar-2018, ASHAWAY, RI: InnoTech of Pawcatuck, CT, has announced the launch of a new mobile-friendly website for Comolli Granite of Ashaway, RI. This new, mobile-friendly website showcases the custom granite memorials, monuments, and mausoleums which are produced by this local family owned granite business. Shoreline Plumbing & Heating of Clinton, CT, is the latest to get a new mobile-friendly website from InnoTech. Read about the completion of this new website here. InnoTech of Pawcatuck, CT, has announced the completion of a website redesign project for one of our long time clients, The Law Office of George Comolli in Westerly, RI. InnoTech is a leading provider of 3D interactive photography, Aerial video and photography, Website Design Services, Website Hosting, Mobile Website Services, Email Marketing, Social Networking Services, and Search Engine Optimization for small businesses throughout Connecticut and Rhode Island. With over 100 unique website design projects successfully implemented over the years, InnoTech has the experience to deliver for your small business or non-profit organization. InnoTech is a Limited Liability Corporation (LLC) which is registered with the State of Connecticut. Visit www.innotechllc.us to learn more about InnoTech and the professional business services which they provide.